When several Post 46 American Legion Riders noticed Darwin Judge’s grave marker sinking earlier this year they took action. With the family’s permission, they put a new granite slab under it and added a flower vase and plaque. Judge is buried in the local Rose Hill Memorial Gardens next to his parents, Henry and Ida Judge. Mike Ball of the Riders said plans are underway to also install a bench in Darwin’s honor. Lance Cpl. 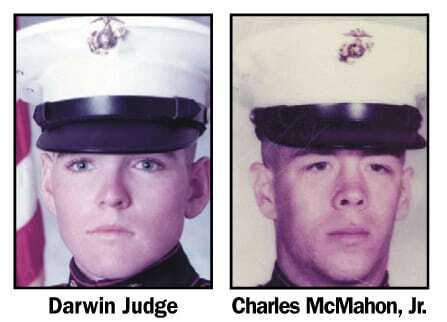 Judge, 19, of Marshalltown along with Charles McMahon, Jr., 21, of Woburn, Mass., had their young lives cruelly extinguished by a 122 mm North Vietnamese rocket, which scored a direct hit on their Post 2, Tan Son Nhut airport near Saigon. Judge and McMahon were on guard, and were the last American servicemen to die from enemy action on Vietnam’s soil. They died just hours before the beginning of the evacuation of Saigon, which ended April 30, 1975. Judge’s late mother, Ida Judge, talked with the T-R at the family home in April 2010, near the 35th anniversary of her son’s death. She died in 2011. Her husband and Darwin’s father, Henry, died in 2002. “Every place you look you find something that Darwin made,” Ida said, while holding several small wood and leather craft projects crafted by Darwin in Boy Scouts. Darwin was an Eagle Scout. Darwin made a grandfather clock which stood in the living room. “He made that the last seven weeks he was in (high) school,” Ida said. Ida said Darwin enlisted in the Marine Corp after high school. “He wanted to be the best, that’s why he joined the Marines,” she said. That effort continued in Darwin’s role in Saigon’s evacuation. Respect for Darwin by his friends and those who knew him is compelling. Marshalltown did not forget their native son. A large color photo of Judge and plaque, is displayed prominently near Marshalltown High School’s main entrance. A park on 12th Street is named in his honor. The Historical Society of Marshall County has a large display on its second floor dedicated to Judge, McMahon and all veterans. Darwin’s sister, Lori (Judge) DeSaulniers of Marshalltown was grateful. “We appreciate everything they (the Riders) have done,” she said. T-R PHOTO BY MIKE DONAHEY Shown recently is Lance Cpl. Darwin Judge’s grave marker at the local Rose Hill Memorial Gardens. American Legion Post 46 Riders had a new granite slab installed and added a flower vase and plaque with permission from the Judge family.